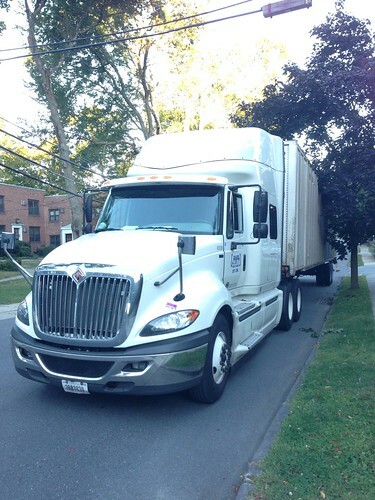 Last Monday began the real part of our move to Chicagoland. We brought the guys to their last day at day care on Monday to buy us the time to try to wrap up last minute things in our apartment. We were supposed to fly out on Monday but due to a booking error on my part that had to get moved up to Tuesday. This ended up being an extremely lucky error. Nana and Grandpa came over in the evening to see the boys and were kind enough to volunteer to watch the apartment while the movers packed us up. This would turn into a huge regret for them by the middle of the week. 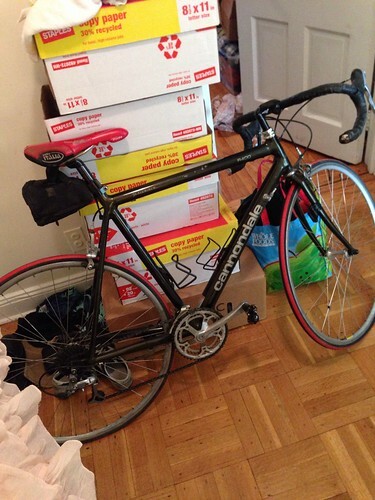 During the packing I discovered that my bike had been stolen from our basement. Luckily, while going into one of the other buildings in our complex I happened upon something that looked suspiciously like my bike. It ended up looking enough like my bike that I was convinced it was my bike. Someone had actually put some work into it, removing the old broken shifters and cleaning it up. That extra work made it extra sweet when I stole it right back! The moving truck seemed a bit on the huge side of our apartment where it dominated the street and oppressed drivers for two full days. 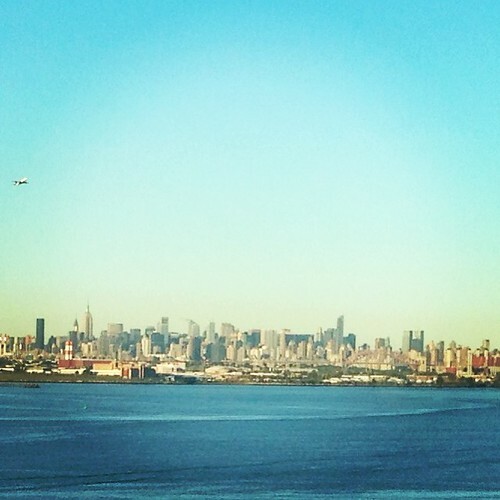 We got an early start to our day on Tuesday and Jen bid farewell to Manhattan as we approached the airport. The guys were extremely well behaved on the plane, allaying all of my biggest fears. In fact I had to spend a lot of time shushing Martin because he was laughing too loud. Then he eventually just fell asleep. Lauren met us in Chicago where I installed the car seats in her car before heading back into the air airport to board a plane back to New York. Elliott wasted no time getting acquainted with their new play room once they arrived at Grandma and Grandad's. He also wasted no time in making a tremendous mess. Cousing Evelyn took refuge from her rampaging cousins. Pete also found it safest outside, far from their play room. 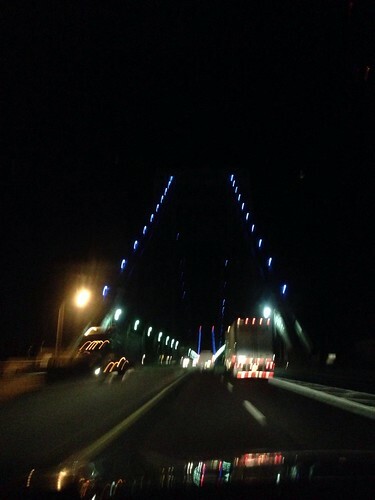 The following morning I woke up at 4:00 AM and hit the road, crossing the George Washington Bridge close to 5:00 AM thanks to the perpetual I-95 New York traffic. New Jersey was quick to get through but not much to look at. As the sun rose over Pennnsylvania, things became a little more interested and I shared the road mostly with just fog and the occasional trucker. 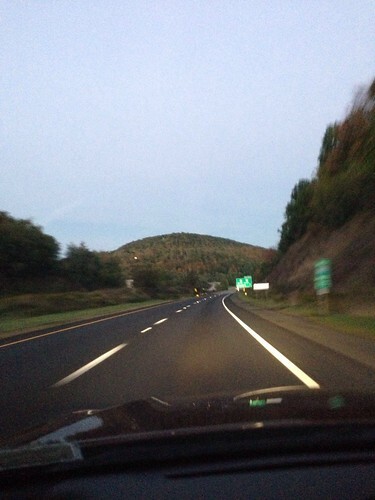 The only other thing that seemed to be in Pennsylvania were these great big signs which lie to you. 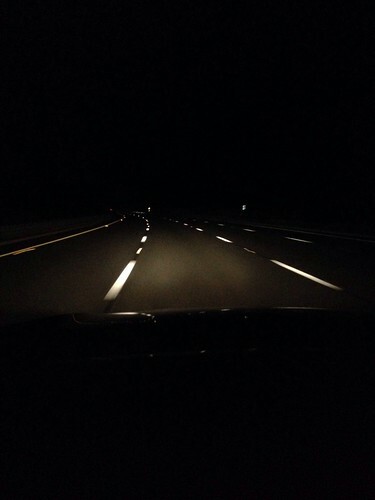 At first I accepted that I was, in fact, going over the speed limit. Out of curiosity I started slowing it down to 60, 55, and even 50 as I passed and each time the sign just lied, saying I was going greater than 65 miles per hour! 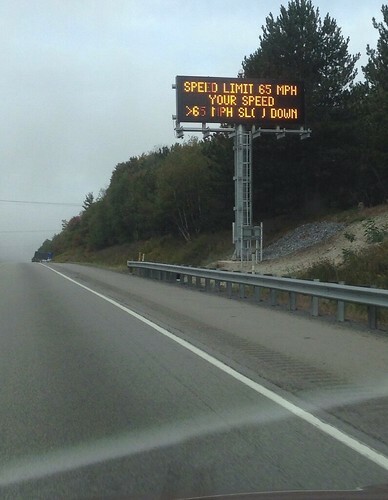 I wonder how effective these signs are in reducing speeding. Maybe they should try another tactic to reduce crime by having the signs say, "Hey! We know about that body in your trunk!" 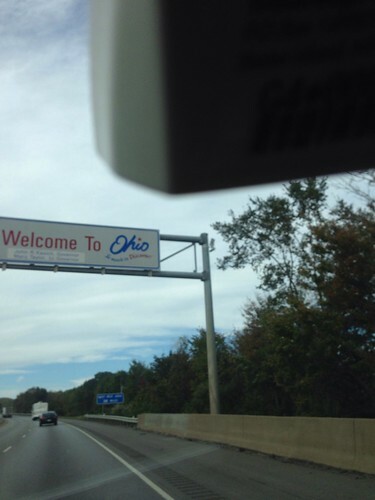 Around noon I entered into Ohio, home of the famous Ohio Grassman! 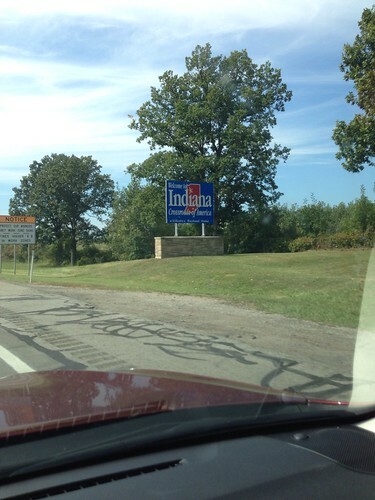 After an uneventful few hours in Ohio where I only ran into comedian Doug Stanhope at a highway rest stop, I ended up in Indiana. After fourteen hours on the road I decided to take a quick detour to visit Three Floyds and pick up a few beers on my way to Jen's parents. 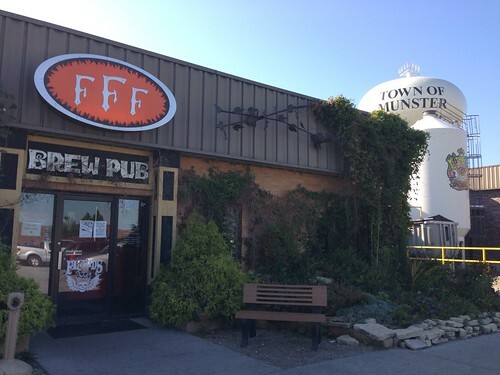 This also gave me the opportunity to tour scenic Munster, Indiana. 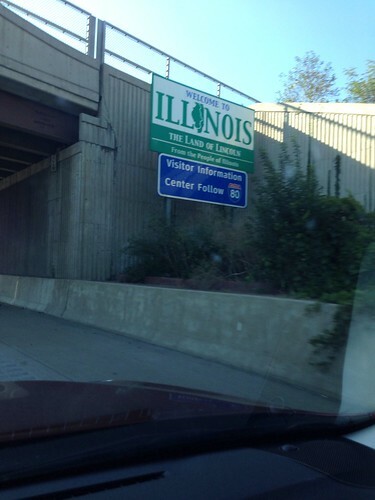 At the end of my journey I entered Illinois where it was a quick drive until I was at my final destination. The boys seemed to have had a great time playing in the yard before I got there but, nonetheless, they were pretty happy to see me. Not as happy, however, as they were about stealing tomatoes from their grandmother's garden and eating them like apples. 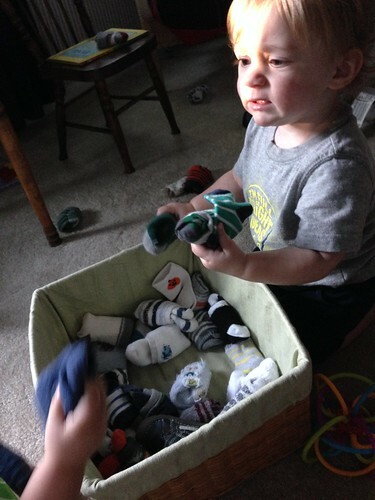 One of Martin's most fun activities so far has been taking the socks out of the sock bin and sorting them. Putting the bin in his crib has even caused him to calm down long enough to go to sleep. It has also caused him to stay awake after distributing them about the room. After his nap I also discovered a secret stash of socks under his pillow. Their grandma also got them a sandbox which they have enjoyed immensely. This has been used to entertain them while Jen and I were off house-hunting. The hunt has not gone exactly as I'd hoped but it has been fun. We found one place we agreed on but, of course, it was snatched up from under us a mere hour after we viewed it. There is another house Jen loves that I'm not crazy about and I house that I love that she is not crazy about. It looks like Christmas as Jen's parents' house may require a car ride from us this year. 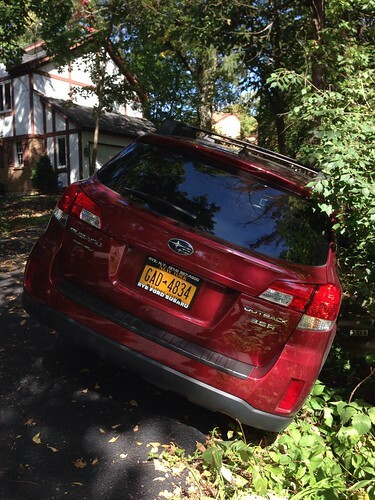 The last stop on our house tour on Friday resulted on me foolishly backing off the driveway into a ditch. This meant about $700 of damage to our car, needing a rental, and severly hindering our house-hunting efforts for the day. 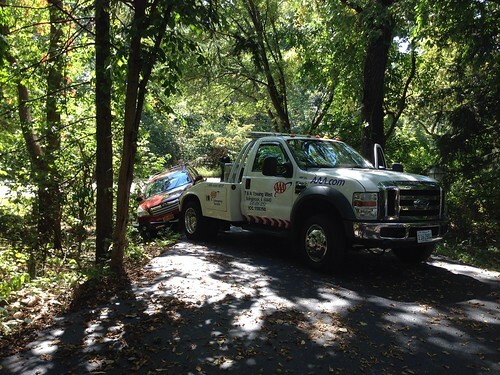 Luckily a skilled tow truck operator was able to pull us out so that we could bring our car to the shop. Sadly, he did not have any tools in his truck to repair humiliation. On Saturday, after a trip to the farmer's market, we wound up at a local zoo where Martin was fascinated by wolves. Elliott was taken with the majesty of the bald eagle. Martin liked maple leaves better than bald eagles so I think they have both chosen their allegiances carefully. Jen had picked up a tunnel at Ikea that they both avoided like the plague for the first few days but finally they warmed up to it. Elliott enjoyed how much the tunnel made him look like he was in the opening to a James Bond film. We eventually depleted Jen's parents' house of food and had to make a trip to the grocery store to restock, mostly on milk which they are now paring up to drink a gallon of a day. 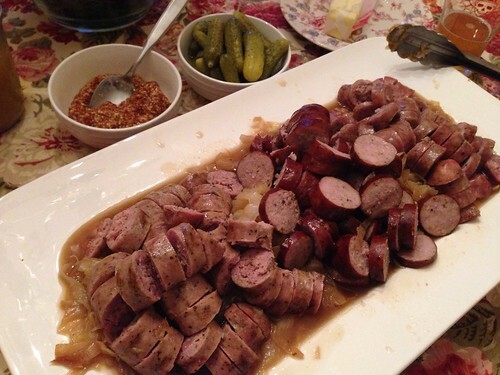 I made some beer braised bratwurst, Italian sausage, and kielbasa for a fall Oktoberfest meal. 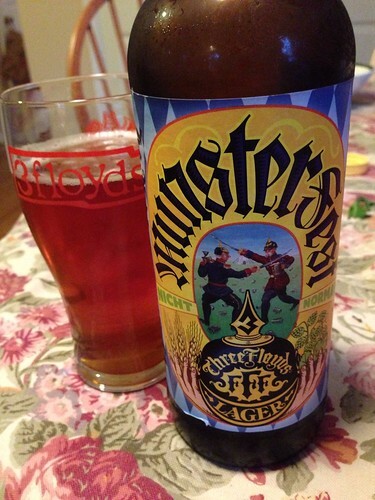 And, of course, this was only so that it could be an appropriate accompaniment to the Three Floyds Munsterfest beer. Cousin Evelyn came over for dinner and we all worked carefully to make sure the boys did not trample her. Martin has been very nice and gentle and has even given her nice hugs. Elliott has been a little more like Lennie Small in his affection. Doug picked up this Mirai sweet corn at the farmer's market after raving about how good it was and his raves were justified. 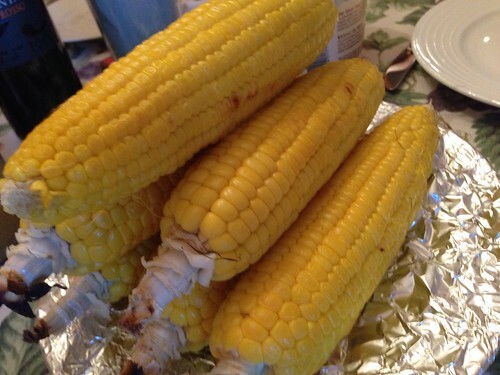 This may have been some of the best corn I ever had. We had the corn the following night along with a giant plate of ham which seemed to worry Martin at first, until he had a taste. On Monday the boys attended their first day at their new day care where they warmed up quickly and made some new friends. 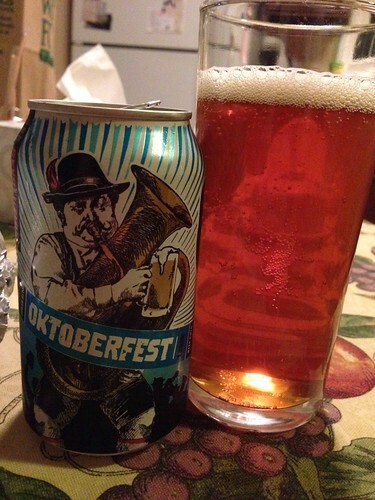 After getting them to bed, and after my first day at my new job, I celebrated the area and the season with this Oktoberfest from Revolution Brewing. There is no shortage of new beers to try -- maybe the best side effect of moving across country. Today I'm checking out an open house before I head to work in hopes that we will be able to find a place soon. If not, I think I found a place that may just be in our price range.